I often get asked if I can recommend moto-drivers and tour guides and the answer is yes, I certainly can. There are a few moto-drivers in particular that I use whenever I'm in their part of Cambodia because they are trustworthy, speak good English, are keen to try new locations and above all, they are friends. The moto-drivers and dirt-bike specialists I recommend here will double up as a guide, will bend over backwards to be helpful, they are all very safe and careful drivers and charge fair prices. In my opinion, they're worth every dollar. Meanwhile, for Recommended Travel Companies, click here. I don't say this lightly, but I would, and frequently do, trust this man with my life. Sokhom has been my moto-driver and companion on some of my toughest and most gruelling journeys around Cambodia since I first met him in December 1999. Our first forays into the northern half of the country were localised affairs to Sambor Prei Kuk and Phnom Santuk but subsequent trips have seen us battle against the heat, humidity and atrocious road conditions to get to remote temple sites like Koh Ker, Preah Khan and Preah Vihear. 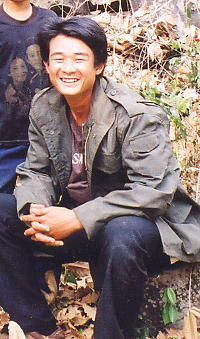 He's become a true friend and companion, he has a great sense of humour and between you and me, he can eat for Cambodia! Even though I take him away from his wife Sroy and adorable daughter Kunthea for three, four or five days at a time, the welcome and hospitality I receive never fails to be a warm-hearted and genuine one. 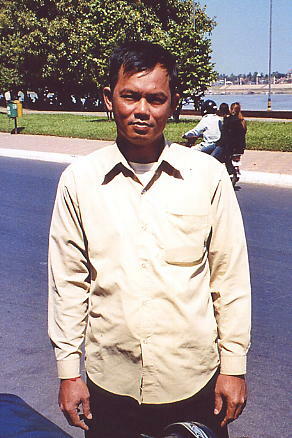 Kim Rieng is a qualified Angkor tour guide, a moto-driver and policeman. 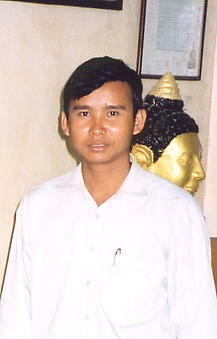 That makes him expertly qualified to guide tourists around his hometown and the nearby temples of Angkor in safety. Rieng was recommended to me by a friend and I first hooked up with him in December 2000 and every trip since. He certainly knows his stuff whether it be each of the main temples in the Angkor complex or more remote and less-visited sites such as Phnom Kulen and other locations well away from the usual tourist trail. We've had some great trips out into the Cambodian countryside temple-hunting and I'm looking forward to many more in his company. 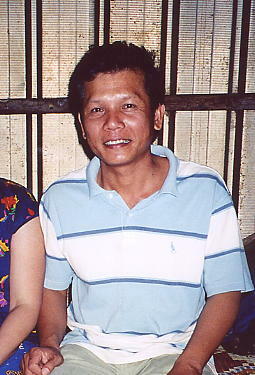 I finally caught up with Paul (his Khmer name is Buntheoun) in Tbeng Meanchey in January 2003 after exchanging e-mails with his partner Sheila. 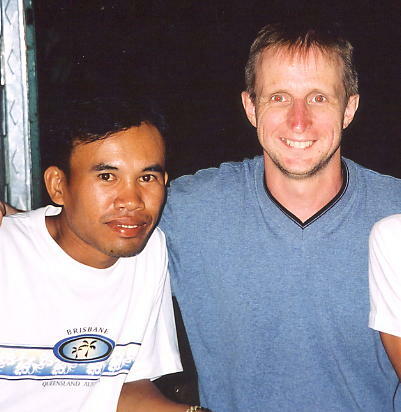 Paul is an experienced dirt-bike rider, is an excellent English speaker and has an extensive knowledge of the more remote parts of Cambodia. 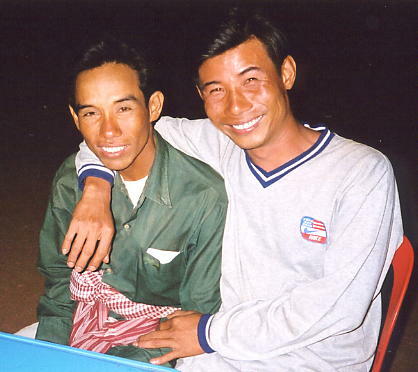 We joined up together for a trip to Anlong Veng and across the northern half of Cambodia to Samrong and back down to Siem Reap in December 2003 and I would recommend him, as a satisfied customer, without any hesitation. He runs a company called Hidden Cambodia Dirt Bike Tours, operating out of Siem Reap and will act as a guide for individuals or for groups of riders. They also have 4-wheel vehicles available, which are becoming ever more popular. Visit Hidden Cambodia's website for more details. Comments that I've received from travellers who've used the driver-guides above include the following; Sandra said of Sokhom, "Sokhom was as marvellous as your recommendation. Thanks." Bob wrote to me and said, "I want to thank you for recommending Rieng who, indeed, is a terrific guide and an even better person." Todd remarked, "I thoroughly enjoyed meeting Kim Rieng and he was an excellent guide." 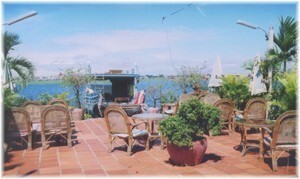 Bryan added, "I wanted to thank you for putting Rieng on your website. 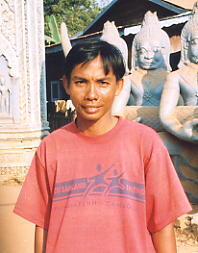 He is a great guide and person and we were so fortunate to have him guide us for our time in Siem Reap." Kitty enthused, "we really fell in love with Rieng and his father in law. His vibe was inspirational and we felt safe and extremely well taken care of the whole time." 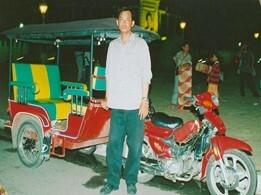 Eddie followed up his trip with, "I used Ran whilst in Phnom Penh and Kim Rieng in Siem Reap. I was absolutely satisfied and happy with their services." 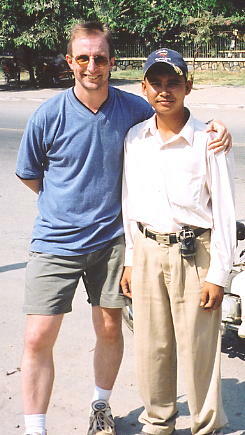 14 year old Brannan remarked, "Heang is probably the nicest guy you will ever meet. If it was not for his help during our trip to Cambodia our visit would not have been the same. 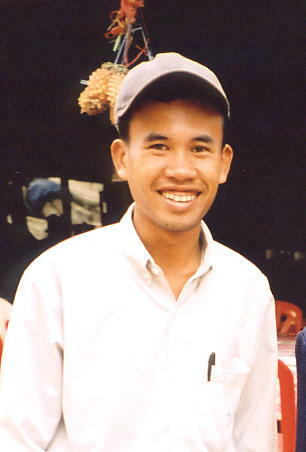 He has a huge knowledge of Siem Reap and his infectious smile makes every minute you spend with him a pleasure." Please note: To contact these individuals by telephone from outside Cambodia, dial your international access code followed by the country code of 855 then the local area code (minus the initial 0) then the six-digit number. The 012 local code denotes a mobile phone number. And don't expect a same-day response by e-mail as they may check their e-mail account only a couple of times each week.